Raised Console Iconography– Raised console iconography and colour allows easy identification of the main controls both by colour, large buttons and text for older users, plus raised iconography for visually impaired users. Emergency Stop Lanyard– Emergency stop lanyard provides safe emergency stop for users with limited upper limb function. Multiple Belt Logos– Multiple belt logos ensure that one logo is always completely visible at all times so that visually impaired and other users can recognise if the belt is moving. 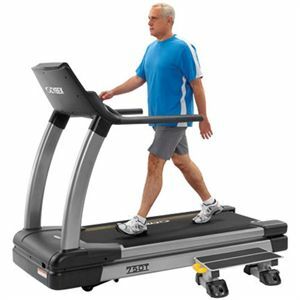 Colour Contrasted Deck And Belt– This allows users to safely differentiate between the moving and non moving parts of the treadmill from the static side rails. ToughTrain 4.0 out of 5 This rehabilition and wellness machine comes in a reasonable price. Perfect for medical use. *Note: Most of the sites, stores or shopping portals listed above sell CYBEX 750T IFI Treadmill with discounts and other exciting offers. There is a possibility that the some of above websites are not selling CYBEX 750T IFI Treadmill now. Toughtrain.com is not liable for such cases or instances. Also we do not recommend any seller for CYBEX 750T IFI Treadmill and a buyer should buy from where he/she gets best deal with quality of products, service and on time delivery (shipment).